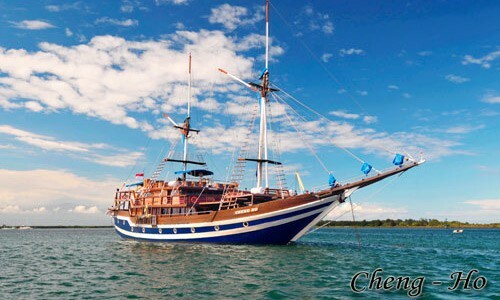 Cheng Ho is one of the most comfortable vessels for leisurely expeditions throughout Komodo archipelago and Indonesia. This 49m-long Phinisi with a cruising speed of up to 8 knots, can accommodate a maximum of 20 divers. Most of the Komodo liveaboards usually cruise for 6 to 12 nights, however the itinerary to Cheng Ho is more flexible and can be tailored according to your needs. Cheng Ho Cruise Boat Budget Range / Price: Starts at US$ 49,350 for a 7 nights tour. Cheng Ho isn’t as big as the WAOW with the 33 meters but very comfortable as well. It was our second time in Komodo island and this time, we took a different boat for a different experience. My husband and I had a seven day, 6 nights trip from Labuan Bajo to Komodo and vice versa. It was a trip to remember. We had about 20 guests on board and my husband had a great time talking to the dive director and dive masters. Diving around Komodo is not for the beginner. There is a different kind of experience in Northern Komodo and a different one in the Southern area. The Northen trip was a typical colorful tropical underwater experience while the Southern part was more on a murk dive. It was a good thing that the dive masters had plenty of knowledge with the locale. Other than diving, my husband and I enjoyed snorkeling and fishing, of which the equipment were provided by the Cheng Ho crew. The Cheng Ho is maybe one of the most well-organized liveaboard I’ve been on. The dive deck was a shaded space with tables lining up with equipment, all you have to do was pick yours up and go. The crew would also help us board our equipment on our chase boats. The saloon was spacious and we had a large soft couch where we could enjoy watching TV. The sun deck outside was also shaded with lots of wooden recliners you could lie on. My cabin was a single bed cabin and had its own air conditioning and en suite bathroom. There was daily housekeeping and I couldn’t complain about them keeping my room fresh and clean. I went there last April and I was expecting a lot of Manta Rays. The dive master told me it was best to go there during rainy season like December where Manta rays were by the dozen. Currents were also strong too around the northern side but I enjoyed it. Drift diving was very nice! Chase boats were also always present of course and we have briefing sessions before our dives. We got lucky and saw a giant Mola Mola and we even had a good sighting of grey sharks. I would definitely recommend Cheng Ho to my friends for a hassle-free and comfortable live aboard trip. One of the best Komodo Liveaboard Boat!